monday musing: a good book! The great 20th century novelist William Gaddis once wrote, “That’s what my work is about, the collapse of everything, of meaning, of language, of values, of art, disorder and dislocation wherever you look, entropy drowning everything in sight.” Gaddis was born in 1922. He was an unabashed theorist of decline. For him, the novelist’s task was to narrate that decline, all the way until there was nothing left to say, until language itself gave up the ghost and we’d be left with a literature of empty mumbling. Alas, just when things seemed like they might truly fall apart for Gaddis’ generation, the next comes along and makes sense of the chaos. Human beings are known to adapt. Give each historical catastrophe long enough to settle and the world simply becomes the world again. Thus has the dilemma always been for the apocalyptic mind. It is a mind well suited to show us how bad things really are, but ill-suited to recognize the staying power of that essential badness. 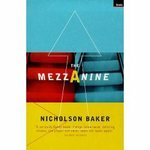 In a funny way, I see Nicholson Baker’s The Mezzanine as a sequel to the work of William Gaddis. I say that because they describe the same world. It is a world of meaningless work and a language hopelessly diluted into the jargon of commercial transactions and the exchange of goods and services. Baker’s world is as empty as Gaddis ever said it would be. And yet, it is not. Baker’s protagonist is a man who spends the entirety of the short novel traveling up an escalator to the mezzanine of the corporate building where his office can be found. His job, a nameless one. His relationships, superficial and generally characterized by office chit-chat. The novel spends most of its time following the narrator’s train of thought as his attention wanders from one mundane subject to the next. But Baker manages to show that within this “empty” experience is, in fact, a richness of human subjectivity vast and complicated as to be a wonder. Valves that allow a controlled amount of water to rush into a toilet and no more, shapes of porcelain designed so that the turbulence in them forms almost fixed and decorative (yet highly functional) braids and twists that Hopkins would have liked; a little built-in machine that squirts pink liquefied soap with a special additive that gives it a silvery sheen (also used in shampoo recipes now, I’ve noticed) into the curve of your fingers; and the soap-level indicator, a plastic fish-eye directly into the soap tank, that shows the maintenance man (either Ray or the very one who was now polishing the escalator’s handrail) whether he must unlock the brushed-steel panel that day and replenish the supply ; the beautiful chrome-plated urinal plumbing, a row of four identical states of severe gnarledness, which gives you the impression of walking into a petrochemical plant, with names like Sloan Valve and Delaney Flushboy inscribed on their six-sided half-decorative boltlike caps—names that become completely familiar over the course of your employment even though if asked you couldn’t come up with them. It’s the reference to Gerard Manley Hopkins that interests me most here. “Look at the world we are given just as Hopkins looked at his,” Baker seems to be saying. And then he goes out and does just that. Hopkins called this way of looking “inscape.” He said, “Poetry is in fact speech employed to carry the inscape of speech for the inscape’s sake.” What he meant was simply that poetry had to pay very close attention to the specific complexity that makes each thing unique. Inscape is that inner uniqueness. Baker, contra Gaddis and in a Hopkins frame of mind, suggests that we are not any more or less able to reflect on experience and “inscape” now than at any other time. All that’s required is a touch of enthusiasm. I mean that in the ancient sense of the term, the Greek sense of the term. For the Greeks, enthusiasm was about entheos or being possessed by a God. It was sort of like channeling. It meant that one had become a vehicle to express something beyond oneself. To be entheos is thus to be fully absorbed. This is almost the exact opposite of the stance Gaddis takes toward the world and his prose. Gaddis wants to reproduce the language of his time in order to make the reader aware of its degradation. He wants to be in language just long enough to get outside it and see it as a whole. That’s how he can express the world and condemn it at the same time. Baker’s enthusiasm goes head over heels in its immersion. It thus has little to say about the world as such, the era, the relative progress or decline of history. Baker’s narrator simply lets himself go, lets himself interrogate every detail and think through every interaction ad nauseam. The result is an estrangement of the world that, paradoxically, brings it ever closer. The more intently one thinks about what it is really like to tie your shoes, the more it seems a wondrous and fantastical activity and the more, then, we are able to see ourselves as that weird combination of happenstance and habit that is so very human. This is what Hopkins wanted to accomplish in his poetry, to concentrate so intently on the details that the divinity would arise therein. Baker operates without the implicit theology. But he does think that the details will illuminate us, capture us, as it were, in the activities that mark us as a specific people at a specific time. The world, our world. If nothing else, it is inexhaustible in its fascination.